Each year in early October Yale celebrates Founders Day, and the Yale University Library participates in the festivities with an open house at which departments present ongoing work and projects accomplished. 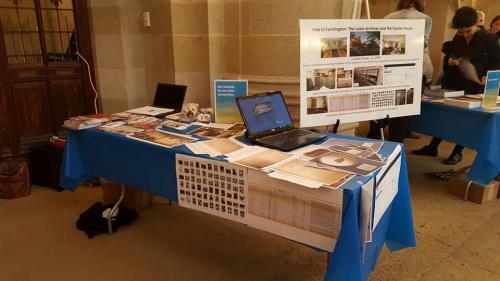 The LWL this year focused on “Yale in Farmington: The Lewis Archives and Cowles House” which included a poster board, printed images, new finding aids, and an extensive electronic slide show. Head of Public Services Sue Walker and recently retired Lewis Legacy Archivist Sandra Markham spoke with visitors about the two-year-long processing project that resulted in 2826 household objects documented, inventoried, and stored and 5 collections, 297 linear feet, and 542 boxes of archival documents processed, rehoused, and stored. Visitors from Yale’s libraries, medical school, and various graduate programs, as well as members of the public and academic librarians from throughout Connecticut stopped by to learn about the project and pick up ever-popular LWL brochures, bookmarks, and stickers.